Almo Nature Classic Adult dog food is meat and/or fish for dogs, made of pure ingredients. Almo Nature Classic Adult dog food contains meat and/or fish for dogs and is made up of pure ingredients. 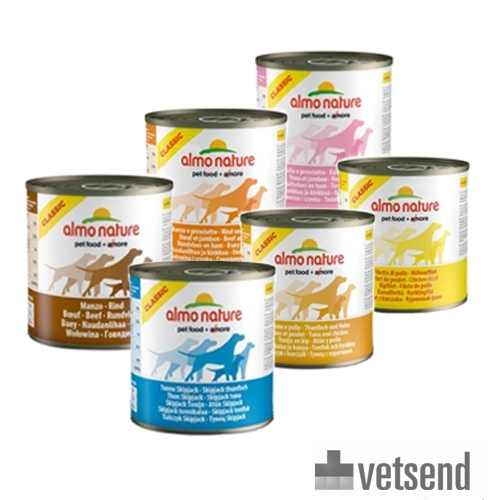 For adult dogs there is the Almo Nature Classic Adult dog food. This tasty and classic canned food is prepared with natural ingredients and consists of no less than 50% meat or fish. The meat comes from free range (free from antibiotics and hormones during breeding) animals and the fish is caught fresh from the sea (not farmed). The meat and fish is cooked without chemical treatment and preserved in its own cooking water. This helps maintain nutritional value and flavours, and has no added minerals, vitamins or additives as the fish and the meat are naturally rich in these components. Almo Nature products have no chemical preservatives or colourings added. The sheer simplicity and authenticity make this meal a classic with a delicious flavour, which is well liked by dogs. Dry food is a basic food for dogs. By combining this with Classic Adult dog food from Almo Nature, the dog's sense of smell will be stimulated. This contributes to an even tastier meal and the dog will receive more of the necessary nutrients for an optimal nutritional balance. Classic Dog food is available in various flavours and comes in packs of 12 cans of 290 grams. The Chicken flavour is available in packs of 12 cans of 280 grams. Have you used Almo Nature - Dog - Classic Adult before? Let us know what you think about this product.